An April Fools' Day joke created by Google as an add-on to Gmail, intended to amuse, jumped up and bit the Internet giant when users complained en masse about the "stupid prank." 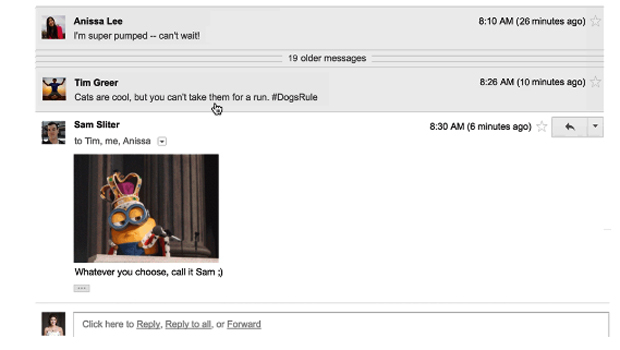 Gmail users awoke to a new feature on Friday, Send+Mic Drop, next to the regular Send button. Pressing the new orange button would insert an animation of a Minion (from "Despicable Me") dropping a microphone. The purpose was to send a fun rejoinder to emails, which would also cut off all further messages to a thread; users would not see any replies, thus ending the conversation. "Everyone will get your message, but that's the last you'll ever hear about it. Yes, even if folks try to respond, you won't see it," the company wrote in a Gmail Blog posting. Complaints poured in to the Gmail Help Forum. "Hmmm, your 'joke' probably caused two or three heart attacks," wrote Russell Ruby. "Very funny indeed." Allan Pashby wrote, "Thanks to Mic Drop I just lost my job. I am a writer and had a deadline to meet. I sent my articles to my boss and never heard back from her. I inadvertently sent the email using the 'Mic Drop' send button. There were corrections that needed to be made on my articles and I never received her replies. My boss took offense to the Mic Drop animation and assumed that I didn't reply to her because I thought her input was petty (hence the Mic Drop). I just woke up to a very angry voicemail from her which is how I found out about this 'hilarious' prank." "Some of my very intelligent friends are senior engineers in GOOGLE," another person wrote. "I almost picked up the phone and shout at them because of this stupid creation made me sound so rude to one important customer when I made a mistake to click this stupid button." Another user, complaining of the "stress causing agent" that appeared on his email account, was freaked out that his business correspondence was being compromised by a feature that's "supposed to be some kind of joke." David Kitner wrote: "This is horrible - Just sent an email to a client with this stupid icon on it. I'll stop using the gmail interface from now on and download thunderbird. I can't afford these stupid pranks!" One user in Turkey wrote, "I can confirm that the wave of rage has hit Europe, and is steadily progressing through the Middle East and on to Asia. This is why there are laws against monopolies: They only pull this kind of stunt because they know they can get away with it. True, this is one straw, but my camel isn't coping too well let me tell you." "Well, it looks like we pranked ourselves this year," the company wrote. "Due to a bug, the MicDrop feature inadvertently caused more headaches than laughs. We're truly sorry. The feature has been turned off. If you are still seeing it, please reload your Gmail page." For those looking to Google for more April Fools' Day fun, without the risk of annoying your correspondents, you can turn to its other April 1 features: Google Cardboard Plastic, a virtual reality headset; an app to help you find missing socks; and the Google Maps app gets funky if you select "Funky Town" from the dropdown.